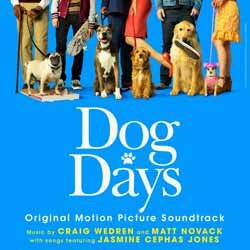 For fans of the movie, the soundtrack to Dog Days will make a welcome addition to your music library. The album contains 10 tracks (36 min, 07 sec), of these the first 7 (23 min, 59 sec) are comprised of songs, with the remaining 3 (12 min, 08 sec) being made up of the film's score by Craig Wedren and Matt Novack. While personally I'd have preferred more of the score (the songs are mostly made up of twee reworkings of once popular tracks) the 12 mins of music we're given are pretty impressive. Probably not one that will be enjoyed by casual soundtrack collectors, but there's still plenty to appreciate here.